The idea of decontamination of environments using green plants is not new. Almost 300 years ago, plants were proposed to be used in the treatment of wastewater. At the end of the 19th century, Thlaspi caerulescens and Viola calaminaria were the first plant species documented to accumulate high levels of metals in leaves. At present, there are about 420 species belonging to about 45 plant families which have been reported as hyperaccumulators of heavy metals. Nowadays, we know much more about the mechanism of plant tolerance towards heavy metal removal and plant efficiency in uptake, translocation, and further sequestration of heavy metals in specialized tissues (in trichomes and organelles such as vacuoles). It is clear enough that uptake of metals depends on their bioavailability, and also plants have evolved mechanisms to make micronutrients bioavailable; in some cases plants have developed resistance to high metal concentrations, basically by two mechanisms, avoidance and tolerance. In avoidance mechanism, exclusion of metals outside the roots is achieved, and in tolerance mechanism the main undertaking consists basically of complexing the metals to prevent protein and enzyme inactivation. One of the major consequences of heavy metal (HM) accumulation in the cell could be the enhanced generation of reactive oxygen species (ROS) which usually damage the cellular components such as membranes, nucleic acids, chloroplast pigments and alteration in enzymatic and non-enzymatic antioxidants. Interestingly, a new family of molecules designated a reactive nitrogen species (RNS) starts to be new elements involved in the mechanism of response against HM where molecules such as nitric oxide (NO), peroxynitrite (ONOO-) and S-nitrosoglutathione (GSNO) can mediate protein function by specific post-translational modifications. Given the nature and extent of contamination worldwide and the costs involved in remediation, scientists made a drive towards alternative cost effective technologies for the remediation of polluted sites. In this regard, bioremediation, typically referring to microbe-based clean-up, and phytoremediation, or plant-based clean-up, have generated much interest as effective low-cost and environmentally-friendly technologies for the clean-up of a broad spectrum of hazardous organic and inorganic pollutants. Plant-based environmental remediation has been widely pursued by scientists as a favorable low-cost clean-up technology applicable in both developed and developing nations in recent years. Physiological, biochemical, and molecular approaches are continually being applied to identify the underlying mechanisms of metal tolerance and hyperaccumulation. The drive to find genes underlying these unique biological properties is partly fueled by interest in using transgenic plants in phytoremediation. Interestingly, as transgenics are being tested in the field and the associated risks assessed, their use appears to be more accepted and less regulated than has been the case for transgenic crops. In last two and half decades, phytoremediation work got so much attention from the scientists and researchers throughout the globe. It is a really promising method to clean our polluted environment. I personally owe debt of gratitude to Dr. David W.M. Leung, who did an excellent job in compiling this eBook with recent advancement in this field and also thankful to the authors who contributed their time and knowledge in making this eBook in a nice shape. Overall the information compiled in this eBook will bring together uesful knowledge and advancement of phytoremediation technologies in recent years. A global environmental and public health issue is heavy or toxic metal pollution. Use of green plants to clean up heavy metal pollution is an environmentally friendly as well as a low-cost approach to the problem. This plant-based biotechnology to help to better manage this global public health concern is commonly known as phytoremediation. Presently, there is no wide-spread application of this technology because useful plants with enhanced resistance/tolerance to metal toxicity are still needed to assist remediation of toxic metal-contaminated environments. 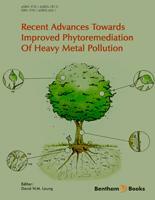 A key to improved phytoremediation of heavy metal pollution lies in research seeking for a better understanding of the mechanism(s) of heavy metal resistance/tolerance in plants. This eBook is divided into two parts. In the first part, an introduction and an overview of the broad applications of phytoremediation were provided (Chapter 1), particularly useful for senior undergraduate, postgraduate students and non-plant discipline-based researchers interested in environmental biotechnology. This was followed by a closer examination of those research foci evaluating chemicals directly or indirectly (those released by microorganisms) for promoting phytoremediation potential of plants that are not commonly considered as model experimental plants systems (Chapters 1 to 3). In the second part, recent insights, largely at the molecular and genetic level, gained from the use of each of the several model experimental plants in relation to the general theme of improving phytoremediation potential of plants were reviewed in Chapters 4 to 7. The unique arrangement and treatment of the topics have never been brought together comprehensively in a single advanced resource book. The different chapters were written by researchers who have recently contributed original research papers in the field of phytoremediation. Their contributed chapters in this eBook are, however, written at the levels intended to be useful to students (senior undergraduate and postgraduate), and researchers in plant physiology and biotechnology. In addition, soil scientists, environmental science students and researchers in environmental and contemporary natural resource engineering departments should also find this as a helpful resource.